Letting the Little Children Gather at General Convention “Let the little children come to me and do not hinder them…” Our job as Christians is to remove whatever hinders them, whatever assaults and hurts their bodies or souls. General Convention is using the tools of legislation to try to do just that, “for to such belong the Kingdom of God.” To such belong the future, not only of the Episcopal Church, but of the world. Two nursing babies attend General Convention with their deputy mothers, and a handful of children gather in the “soft space” provided for them during worship, but the long-term wellbeing of all children is woven throughout this General Convention. 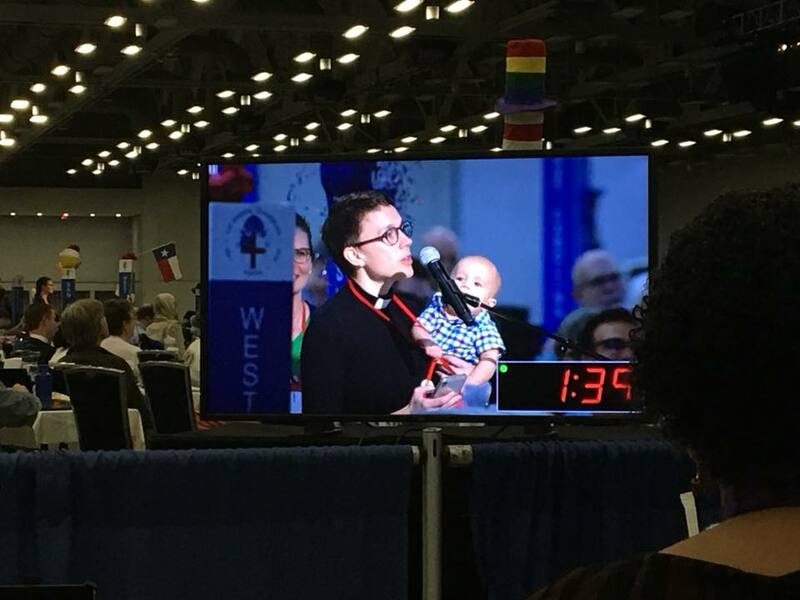 Specifically, the resolutions A034: “Fund the General Convention’s Children’s Program,” D087: “Parents Nursing and Bottle-Feeding Children,” and A033: “Supporting and Expanding Episcopal and Youth Event,” focus on children connected to the Episcopal Church. The prophetic voices of our young people compel us to action. Passing B005 gives our Public Policy Network and Office of Government Relations the chance to advocate for sensible and sane gun legislation for the sake of all our children. “Let the little children come to me and do not hinder them…” Through legislation, we make what steps we can to keep children safe in the arms of our loving Lord. Other resolutions that address the psychological wellbeing of all our children include accessibility for the deaf and disabled, ministry to those with and affected by mental illness, the inclusion of transgender and non-binary people, and suicide prevention training for clergy and other adults who work with youth. This means, for example, that my transgender step-granddaughter has a better chance of being accepted, safe, and “seen” for who she is as a whole person. And the “Call to Respond to the Opioid Crisis,” which our own Diocese of Maine presented through Province 1, is ultimately about children, too, as so many of them are separated from their parents because of this scourge. When I testified at the hearing on this resolution, I shared part of a prayer composed in one of my workshops for incarcerated mothers, most of whom are serving time as a result of their opioid addiction: “Please watch over my babies. Keep them safe, protect and guide them. Put a shield of protection around my children. Watch over them during this time when I can’t be with them.” Haunting grief and guilt inhabit their prayers. “Let the children come to me and do not hinder them…” And then there is the Earth itself, which humanity is damaging in such profound and devastating ways that our children’s futures will be diminished. At General Convention, we had a special listening session on Care of Creation. It hurt my heart to hear Bernadette Demientieff from the Gwich’in First Nation people in Canada speak of drowning polar bears, rising waters, precipitous decline in the caribou, who for 40,000 years have been the source of food, of songs, of stories for her people. In tears, she begged help for her children, and for their descendants, by addressing the reality of climate change. And we well know that the climate change crisis isn’t limited to the Arctic. It affects everyone’s children. It’s about potential water scarcity, dried out farmland and resulting food scarcity, killing heat and violent storms. I wept with Bernadette Demientieff for her people, and for the future of my own grandchildren, and their children and grandchildren, if we do not act. And so we did. We are passing legislation that acknowledges climate change and mandates creation care, addressing matters such as ocean acidification, reduction in carbon use, water as a human right – again, matters that our Episcopal Public Policy Network and Office of Government Relations can advocate for in Washington – for the sake of this Creation that God calls “good,” and for the sake of all the generations yet to come. This General Convention recognized the value of children and that the Kingdom of God indeed belongs to them. Thank you so much for this post. I will be preaching this Sunday about being moved in our gut— compassion— and for me this connects with caring, valuing, protecting and loving our precious little ones. Keep up the good work and thanks again for sharing. I am passing on your post to people at my church, St. Thomas, Eugene, Oregon. Thank you, Ryan. It was such a privilege to be there, to witness and participate in the work of Convention, to feel the passionate commitment to the wellbeing of our children, of all children. “Let the little children come to me and do not hinder them…” Our job as Christians is to remove whatever hinders them, whatever assaults and hurts their bodies or souls. General Convention is using the tools of legislation to try to do just that, “for to such belong the Kingdom of God.” To such belong the future, not only of the Episcopal Church, but of the world.